With just a few lines of code and a couple API keys, your application can set up Push Notifications using Twilio Notify, Google Firebase and your choice of web language. We have code for you to stand up a server in C#, Node.js, PHP, Python, Ruby, and Java. Before you can send push notifications with Notify and Firebase, you'll need to sign up for a Twilio account or sign into your existing account. For now, that's about it - you'll need to set up an account with Firebase and get FCM credentials before you can move forward with the app. Leave the Twilio tab open and move to the next step. 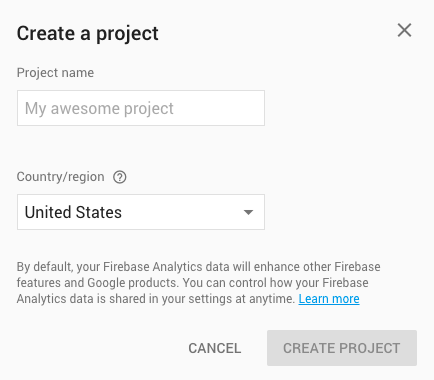 In Firebase, the FCM Secret is called the Server Key and you can find it in your Firebase console under your Project Settings and Cloud Messaging tab. 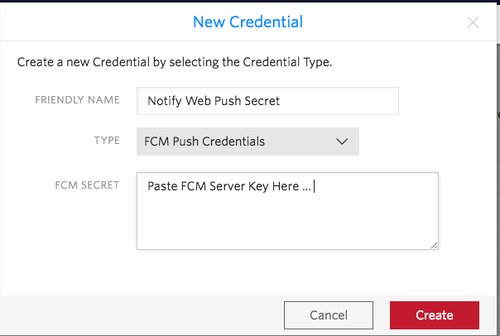 Once you have the secret, next you need to create a credential on the Add a Push Credential page on the Twilio Console using the FCM Secret. In the Notify console, create a new Notify service. Inside the new service in the FCM Credential SID dropdown, select the Credential that you have just created. Make a note of the Service SID. You will use it later when you start writing code. In order to authenticate your requests to Twilio API, you need to create a API Key. 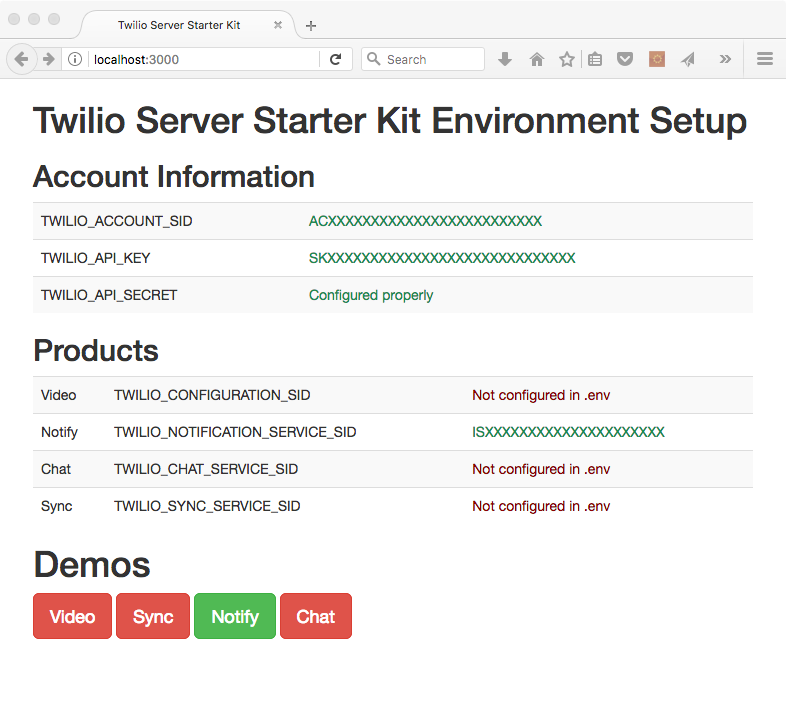 If you have already been using Twilio and have created API Keys, you can skip this step. In Console, go to https://www.twilio.com/console/runtime/api-keys and hit ‘+’ to create a new API key. Give your new key a Friendly Name and choose the “Standard” type. Hit the "Create API Key" button to generate the key. The generated Secret is shown only once, store it in secure place. You will not be able to see the secret in the Console later. (If you do miss it, you can generate a new service). Used to authenticate REST API requests. Hopefully you stored it, but if not create a new API Key here. For this example we'll use the Node.js server. Feel free to copy our choice or follow along in the language you prefer. Follow the Node.js installation instructions here and complete the installation. Next, edit the .env file to include the four configuration parameters (Account SID, API Key SID, API Key Secret, Notify Service SID) we gathered from above. Now we need to install our dependencies. To confirm the server is running, visit http://localhost:3000 in your web browser. You should see the home screen, informing you of which Twilio services you've configured. To get you going quickly, we provide a Web Push sample app, available on GitHub. If you haven't done it yet, follow this guide to configure Web Push Notifications for the Twilio Notify sample Web Push app. Next, you'll need to collect the Firebase Sender ID and Web API Key and configure the demo app for your Firebase project. To obtain these keys, go to the Firebase Console and open your Project Settings. Next we need to create a binding between a Identity and the browser using the web app. The Identity can be any unique identifier you choose, for example a GUID. You can find out more about Identity and Bindings in the Binding resource reference API. Note: If you do not see a device token in the Address bar the first time you launch the app, reload the page. The demo app code is naive and doesn't handle the race between the App asking for and obtaining a token. Additionally, check the browser console for misconfiguration issues or hints. Notify uses Identity as the unique identifier of a user. Do not use directly identifying information (personally identifiable information or PII) such as a person's name, home address, email address, phone number, et cetera, as the Identity. The system that will process this attribute assumes it is not directly identifying information. In the app enter the Identity you chose and click the button "Create Binding". This action creates a Binding which uniquely identifies a user on a certain device running your application. Now that we have the Binding, we are ready to send a Push Notification. To send a notification, you can use the Notify page on the “backend” service you have running at http://localhost:3000/. Go ahead and click the "Notify" button at the bottom of the home page to go to the Notify page. On this page, send a message to the identity you used in the app. Because you registered a binding with Twilio, the server will send your device the message as a notification. And that's all there is to it! You've not got a "frontend" and a "backend" app which can send push notifications using Notify and Firebase, and you're ready to go off and build your own application. We can't wait to see what you build - notify us when you've got something.